Once every two weeks or so, Mr Selwyn Bergquist would have breakfast at The Morning Egg on Main Street. If he had breakfast alone he always ordered “Colonial Fare”: a mixture of sausages, black pudding, fried eggs, bacon, hash browns, and toast. It came with a bottomless cup of coffee. In recent times, however, Mr Selwyn Bergquist had brought along a guest; sometimes two. He would “show off”. On and on would go Mr Selwyn Bergquist. The cook was beside himself. The manager of The Morning Egg had approached Mr Bergquist in private. The manager told him they were very unhappy when he had guests. Please refrain from your loud negative criticisms or eat elsewhere. Mr Selwyn Bergquist was outraged. The following week he brought along three guests, "from overseas!" They were rich! They were famous! The Morning Egg should be honoured to have them eat in its premises. Mr Selwyn Bergquist stormed out. The following morning, the three "from overseas" came back for breakfast. “We rather enjoy the cayenne pepper that comes with the food,” they said. It caught on. 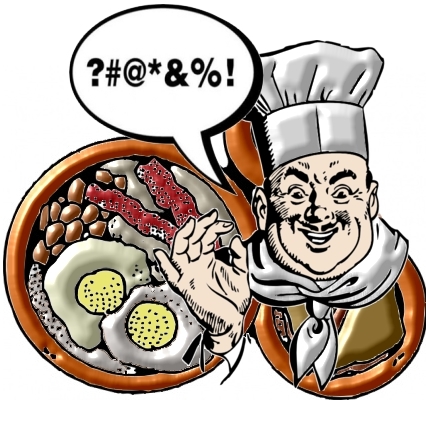 The Morning Egg is now The Rude Crude Food. The place is always packed. The manager’s had to learn new strings of invective. The cook loves it; he can cook any-which-way provided the clients complain.